A Southern Right Whale rises out of the water in the New Golf, Peninsula Valdes, Argentina in June 2006. Southern Right Whales are dying off at a record rate in Argentina's Patagonia region, a conservation group warned. Southern Right Whales are dying off at a record rate in Argentina's Patagonia region, a conservation group warned. "In the year 2012, there were 116 whale deaths reported, including 113 whale calves," the Buenos Aires-based Whale Conservation Institute ICB said, adding that it was nearly double the 61 whale deaths it recorded in 2011. The 2012 deaths represent about three percent of the population of these whales in the South Atlantic, estimated at 4,000, the ICB said. 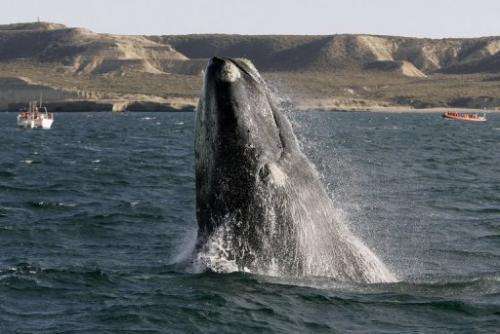 Every year starting in June hundreds of the South Atlantic Right Whales—Eubalina Australis—take cover in the bays of the Valdes peninsula, a UNESCO world heritage site. Thousands of tourists travel to see the nursery phenomenon each year. The whales, about 14 meters (46 feet) long and weighing up to 50 tons, have been dying for reasons scientists do not yet fully understand. But the NGO believes they include climate change leading to less krill, and gulls eating chunks of skin off living whales, which can cause infections.